Coptic Christian man becomes the second Christian jailed for insulting Islam in Egypt in June alone. An Egyptian court has sentenced a Coptic Christian man to six years in jail for "insulting Islam" and stirring up sectarian strife in his village, his lawyer told AFP on Wednesday. Egypt's constitution outlaws insults against the three monotheist religions recognized by the state - Christianity, Islam and Judaism. Kirollos Shawki, 29, was convicted Tuesday by a court in the southern province of Luxor, Mohamed Ahmed Abdelaal told AFP. He handed himself in to police at the end of May after tension flared between Christians and Muslims in his village in Luxor, because he posted a picture of Muslim prophet Mohammed with an insulting comment on his Facebook page, Abdelaal said. But a police official said the man was arrested along with six others who had hurled stones at his house after he posted the picture, and that the six were later released. Islam forbids the depiction of God or Mohammed. The court sentenced him to three years for "contempt of religion" and another three years for "stirring up sectarian strife," Abdelaal added. The man has appealed the verdict and should be freed on bail until an appeals court rules, his lawyer said. Copts, who comprise some 10 percent of the country's 86-million population, are the Middle East's largest religious minority. They have long suffered sectarian violence at the hands of Muslim extremists, including attacks on churches. Earlier this month, an appeals court in Luxor sentenced a female Coptic teacher to six months in jail after parents of her students accused her of "evangelizing" and insulting Islam. 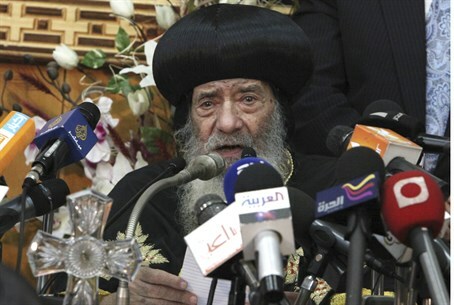 Parents had filed a complaint alleging that she had told her students that late Coptic pope, Shenouda III, was better than the Muslim prophet Mohammed.